"This dish tastes just like the authentic version except it's lower in calories and fat and is a quick recipe to make." In a small saucepan, bring the 2 cups of water to a boil. Stir in the rice and return to a boil; reduce the heat. Cover and simmer for 20 minutes or until the rice is tender and the water is absorbed. Using a very sharp knife, cut the catfish into 3/4 inch pieces; set aside. In a medium saucepan, combine the tomatoes (with juices), dried onions, bouillon granules, dried oregano, garlic powder and hot-pepper sauce; bring to a boil and stir in the catfish pieces. Cover and cook over medium heat for 5 to 8 minutes or until the fish flakes easily when tested with a fork and is opaque all the way through. Serve the fish mixture over the rice. Easy and fast! Tasted wonderful, will be making again. I added red pepper flakes and used diced tomatoes with garlic and olive oil. Added okra too. It was fabulous. This will become a regular in my home. It is extremely easy and a nice change of pace. I used Basa instead of US catfish, minced garlic instead of powder, and omited the onions. Turned out fabulous. Excellent flavor!! This will be used again and again in my house! 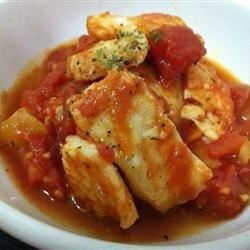 Very simple, but tasty if you like foods with lots of tomato sauce. This was extremely easy to make and very wonderful! I don't care for fish much but this was something the whole family enjoyed! This was just ok. I won't make it again.